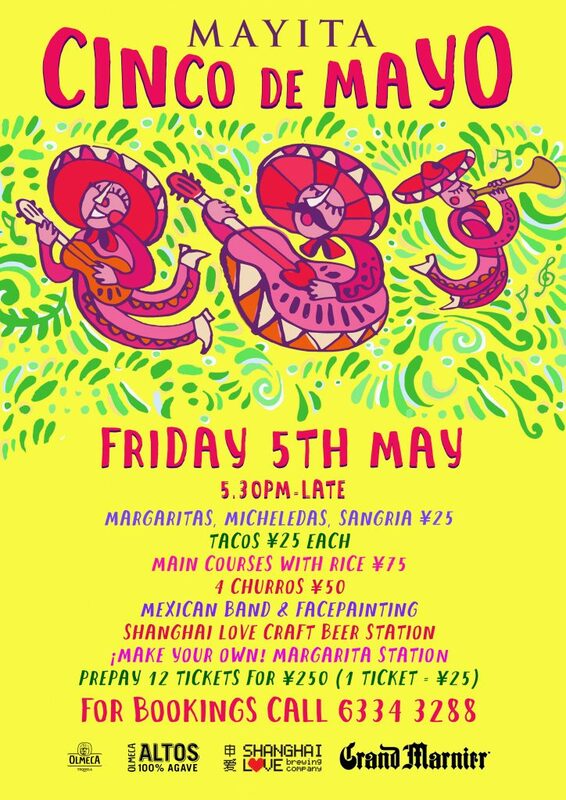 We will be hosting our annual Cinco De Mayo Party on the MAYITA rooftop on Friday 5th May,Cinco de Mayo! A day that is always busy we will once again be hosting a big group of Latin Lovers! Fresh from our biggest day at MAYITA last Saturday, we are looking forward to somefine early-May weather for the event but we will host on the 5th whatever the weather as it’s the 5th and its how they wanted it celebrated! We will have Shirley Maria’s awesome Latin Band as well as Mexican face painting from our good friend andthe best in the business, Kathryn Robbins. We will also have a ‘make your own’Margarita station, a Shanghai Love draft beer station and of course our handyOlmeca Altos Tequila Trolley! Nearly all drinks are 25rmb. We will have Micheladas, funky Olmeca Margaritas, Olmeca Palomas,Sangria,Sol & wine. New drink recipes prepared by our well-qualified MAYITA Manager & Bar Queen Veronica Bravo! Food will be by our new chef Juanito Rebolledo who touches down next week with some serious bags of rare contraband Mexican chillis to help produce a range of mouth-popping tacos(25rmb) & some authentic main course dishes w/ Pueblan moles, where Juanitois from (75rmb). Churros (50rmb) also up for grabs. Our new chef has been living in Puebla, which is where the battle of Cinco De Mayo took place. To guarantee entry, prepaid 6 tickets for 150rmb per person or get 12 tickets for 250rmb as an early bird deal at MAYITA or MAYA beforehand. See you on the 5th Gringos& Tapatios!